602 pages | 43 B/W Illus. 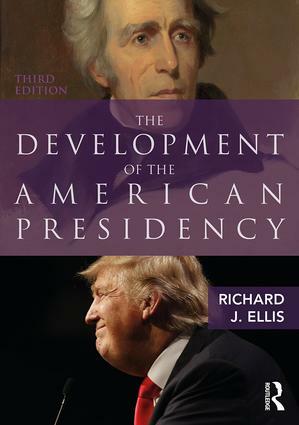 Richard Ellis’ The Development of the American Presidency is a unique and easy-to-use text for a standard presidency course. Because it is organized topically and not chronologically, the political development content is delivered in a framework organized around the institutional and behavior issues examined in most courses, resulting in a comprehensive text that provides the valuable historical context necessary to understand the institution of the presidency. The Development of the American Presidency is an outstanding text and will significantly enhance any student’s understanding of the presidency. It is thorough and authoritative but accessible, and its intuitive organization makes it easy to find information on virtually any topic. By demonstrating that the contemporary presidency is determined by what has come before, it will help students get beyond the headlines to appreciate the nature of the office and its ever-evolving role in American politics and governance. Combining engaging prose with innovative, puzzle-based pedagogy, Richard Ellis’ book continues to provide the perfect option for those looking for an overview of the presidency without sacrificing deep historical understanding. Careful readers will come away with not only a thorough understanding of the powers and politics of the American president today, but also great insight into the historical moments that caused the institution to develop as it has. Richard J. Ellis is the Mark O. Hatfield Professor of Politics at Willamette University. He has been awarded Oregon Teacher of the Year from the Carnegie Foundation for the Advancement of Teaching, as well as numerous other awards for both scholarship and teaching. He is the author or editor of more than fifteen books, including Judging Executive Power: Sixteen Supreme Court Cases That Have Shaped the American Presidency; Debating the Presidency: Conflicting Perspectives on the American Executive; and Presidential Travel: The Journey from George Washington to George W. Bush.